BPA Policies Last Updated 3/27/2017. Weapons and Costumes. Weapons and items that appear to be weapons are not allowed at WBC or other BPA-sponsored events. 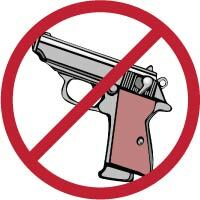 Self defense, recreational and utility items such as knifes, tazers, pepper spray, air-soft weapons, paintball guns, water guns, martial arts weaponry, including wooden practice weapons, etc, are not welcome, even if it is lawful to own and carry them in other public places. Off-duty security, law-enforcement and military personnel are not allowed to bring their weapons to WBC. Items resembling futuristic weapons, fantasy weapons and non-projectile boffer weapons may be allowed provided they are not used in a threatening or destructive way against person or property. WBC Event Staff or security personnel may inspect any item or costume at any time during the convention. Failure to comply with these policies and/or the instructions of WBC Staff or security personnel may result in immediate removal from the convention without refund. If you have any questions about these policies, please contact ConventionDirector@boardgamers.org before the convention.